If you were in NYC on March 31, you probably felt the enchantment in the air. That’s because MUSE was in town. MUSE events are “enchanted evenings where art, life science & technology meet to inspire the Who’s Who in health.” It’s a modern-day adaptation of the salon from the Age of Enlightenment but instead of poets, painters and philosophers, the attendees include physicians, patient advocates, health researchers, health technology startups and pharma professionals. This year, it boasted an inspirational roster of speakers, including our own Louie Schwartzberg and his dear friend, Arianna Huffington. Louie was there to share his research on the impact of gratitude and visual healing with multiple applications within the health industry. Arianna was there to share her newly released book, The Sleep Revolution, with the audience. Needless to say, it was a fun night…. and very pink. We sat down with Louie after he had a chance to recover and catch a few shut-eyes of his own to share some of the highlights and insights, specifically on what generates the most effective presenter-audience interaction. When the lights go down, and the presenter takes the stage, what transpires and why? P.S. 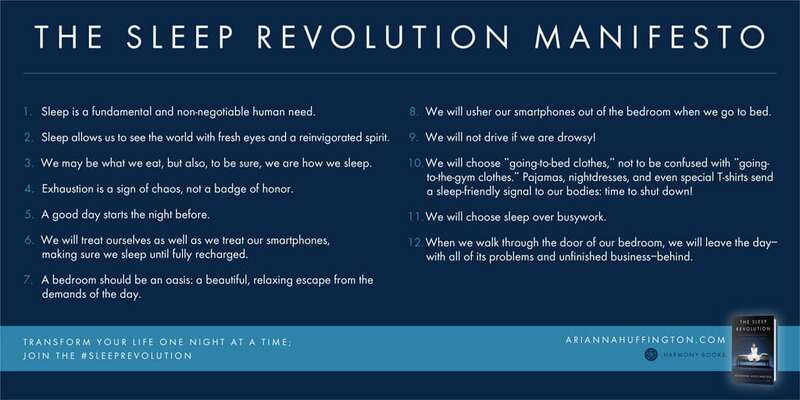 Be sure to click here to download your personal copy of The Sleep Revolution Manifesto, sent with love from Arianna herself! GR: Louie, at this point you are an integral part of the foundation of TED Talks, having almost 50 million views of your various TEDx videos. I know you have an exciting TEDxEstéeLauder talk coming up later this month, hosted by Estée Lauder, shared with a rare presentation by Chris Anderson. I was curious to hear how MUSE compares to your TED experiences? Schwartzberg: Well, the salon platform is such a brilliant idea, and the MUSE folks were really wonderful to get to know. It was much more of a party atmosphere than TED, of course. You had this large purple party vibe, very conducive to networking, whereas with TED you create very intimate dark spaces where there is just you, a red dot and a spotlight before a captive audience. The attendees aren’t even allowed to look at their phone, let alone talk during your presentation. You’re encouraged to interact and meet one another at very specific times and places. So, two very different approaches to the same admirable mission. It did make me think about the invaluable and integral role the audience plays in sharing and making ideas take root and grow, ultimately making effective change in the world. Schwartzberg: Well, in both scenarios, you have a person who gets up all by themselves and expresses a little bit of wisdom, or simply asks a question with their heart and soul fully invested in the answer. But, without the audience member receiving that idea, it really can just die right then and there. Evaporate into space. But, by being an active listener and letting the inspiration enter into you, you are now participating in the event, and helping that speaker make an idea reality, or as we say at TED, “worth sharing”. It’s a joint effort. People at MUSE or TED, or any successful salon event, are encouraged not to be too laid back, just “listening.” They are encouraged to give the speaker their energy by actively being interested. GR: You’re really pointing to the unspoken relationship between presenter and audience member. Schwartzberg: Yes. In theatre, the same play can be either “good” or “bad” based on the audience… Stand-up comedy, that is a shared experience. The audience plays a major component in the success or failure of the event. GR: It sounds like you’re really charging us with an exciting responsibility to actively engage with you and participate in the conversation. We are invited to attend MUSE and TED (if not in person, via the internet) and yet, we have a job. What is our job? Our job is to be respectful, and listen, and take the message, and share it with other people. Schwartzberg: Especially when such an eclectic gathering of amazing people are brought together at these events. MUSE attracts poets, painters, philosophers, physicians, people from every world and industry. That is a really exciting group of people in the room. GR: I love that there is this trend to celebrate and return to traditional oratory. It reminds me of Abraham Lincoln giving the Gettysburg Address. People would travel tremendous distances, simply to hear great people speak. And then they would return to their home and share the “gossip” with everyone. Schwartzberg: It is the same also with the gathering around the campfire. It’s part of our mythology. That’s why narratives and story-telling are so powerful. Today’s modern version of a campfire is going to a movie. It’s why people still like to go to the movies, even though they can watch it on Netflix, because it’s a communal shared experience. GR: From your MUSE presentation, there was this one line you said that really jumped out at me. You were referencing your body of work, and the potential for visual healing, and you said one of the health benefits was that “it makes people feel rich in time.” Can you say a little bit more about what you mean by “rich in time”? Schwartzberg: Yes, Agapi Stassinopoulos, who was there also loved that line and said she was going to “borrow it” [laughs]. I guess what I mean to say by that phrase is the fact that when you are in the present moment, it adjusts your time perception. When you can adjust how you perceive time, the benefits of that, according to research, are that it influences your decision making, it makes you more patient, it makes you more willing to help others, and that makes life more satisfying. Time is the one thing you can’t buy with all the money in the world. Nobody can buy time. When you are rich in time, you are relieved of the stress of being overwhelmed or having too much on your to-do list. You are able to have the freedom to actually say, “I’m going to go for a walk,” or “I’m going to exercise,” or do something for yourself, or just be, without it being a formal meditation practice of some kind. You’re just going to be here without a schedule. GR: I think everyone can relate to that anxious scarcity that we feel often times around time, and the pressure. Schwartzberg: My imagery puts you into that nonlinear space. When you’re in the present moment, it’s nonlinear. You don’t have past, present or future. When you’re in that space, the “now” is eternal. Time is not an issue. If you’re in the now and time is eternal, then you get rid of the tic-tock, tic-tock, tic-tock, pressure of “I got to be here, I got to do this, I got to do that,” which creates so much anxiety. GR: Your work shows us time is relative. It’s like standing in one of those Halls of Mirrors. You’re not sure where the reality is. That almost creates a sense of calm and security. It challenges your perception of time. Schwartzberg: It’s disrupting your perception of reality if you can speed up and slow down our conception of time, our concept of time. GR: But not theoretically. It’s actually experiential. Schwartzberg: That reminds me of a commercial project I did once for NBC news. We actually had a clock in the newsroom, and I sped it up. You see a clock with the hands going around quickly. But, that’s not actually speeding up time, that’s speeding up the idea of time, right? You’re just thinking that the clock is moving faster. I’m more than just speeding up the clock, I’m saying there is no such thing as a clock. The clock does not exist. When you get to that spot, then you realize you’re rich in time. 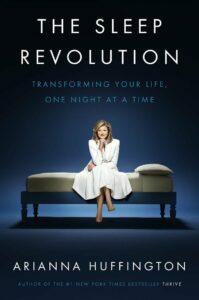 GR: Speaking of rich in time, let’s talk about your dear friend Arianna Huffington. I know how busy you two are. How was it seeing her? What’d you guys talk about? Schwartzberg: She’s pretty amazing. A mere half hour before she’s presenting, or less, she’s having business meetings in the green room backstage. She’s a powerful force, that’s for sure. It was great having her share about her book, The Sleep Revolution. I’ve actually done a video about sleep in the past, so I explained to her the concept of entrainment. The science of entrainment involves going from the complex to the simple. For example, when music is used to help you fall asleep, a piece will start off with music that progressively gets slower or simpler, in terms of the arrangement. That helps the brain go into sleep mode. Another example is the sound of ocean waves and crickets to help you fall asleep. When the brain hears a repeat pattern, and trusts it isn’t going to be surprised by something new or startling, it spreads a message to all parts of the brain and body that it’s okay to let go, and that you’re safe, and that you can fall asleep. With this video that I did, I got the rhythms of nature and patterns to progressively become longer, and the shots to become less and less complex in its composition and imagery, and grow gently darker, with less vibrant colors. Just like with your laptop, when nothing’s going on after a while, it goes to sleep, right? GR: Yes, it goes to sleep. Schwartzberg: It goes to sleep because there’s less input, or the input is predictable and the brain goes, “It’s okay to rest.” The reptilian part of the brain says, “I’m not going to get attacked by a lion or a tiger. I’m not going to have a siren startle me, or a door slam,” which all goes to fear and survival, which obviously is the opposite of falling asleep. GR: Your Visual Healing program is used in a multitude of applications to be physically healing. This seems like a good partnership. Are you guys going to try and do something fun together? Schwartzberg: Yes. I’d love to create a sleep video for her. I think that nature has a spectrum, obviously. Sunrise has a different energy than sunset or twilight. It’s great that there are all these different moods and emotions that exist in nature. I’m just recording those different tempos and showcasing it. GR: It really brings our conversation full circle, doesn’t it? As the observer there’s a responsibility to take the energy of what we witness before us and, as you say, “showcase it” or share it with others. Do you think we are up to the challenge of being responsible observers? Schwartzberg: Actually, I think it all points back to gratitude. The best thing about gratitude is that when you really feel it the first thing you want to do is share it. So at the end of the day, it’s just about that opening of your heart. What you observe – whether a TED Talk or MUSE event or nature – hopefully opens your heart, and your natural reaction is to feel gratitude and inspiration and inherently want to share it with others. So, yes, I definitely think we are up to the challenge. Our grateful hearts will lead the way. to the wisdom we learn from our beloved elders. Let’s share the gift of gratitude.